UNL’s overall enrollment has grown by 15.4 percent since 2005. Powered by its largest freshman class in 35 years, UNL's total enrollment reached 25,006 students in fall 2014 – a 2.3 percent increase over last year and the second-highest enrollment in the university’s history. The 4,652 first-time freshmen represent an increase of 232 students, or 5.2 percent, in the number of freshmen from fall 2013. That’s the second-largest freshman class in UNL’s history and the biggest since 1979, when 4,702 first-time students were enrolled. UNL’s overall enrollment has grown by 15.4 percent since 2005. The all-time high for overall enrollment is 25,075 in 1982. This fall, the university also saw an overall increase in undergraduates over last year -- 19,979 total, or an increase of 603 students (3.1 percent). The College of Engineering led all UNL colleges in the highest percentage of undergraduate enrollment growth, increasing by 8.5 percent. Engineering was followed by the College of Journalism and Mass Communications (8.0 percent), the College of Agricultural Sciences and Natural Resources (6.6 percent) and the College of Business Administration (4.8 percent). “It is particularly gratifying to see increases at the College of Engineering because of the demand for this talent in Nebraska,” Perlman said. Alan Cerveny, dean of enrollment management, said that crossing the 25,000-student threshold was noteworthy but the university remains focused on its long-term enrollment goals. “The growing national attention UNL is receiving is rewarding and I am particularly pleased by the increased interest we’ve seen this year from Nebraska students, from Scottsbluff to Omaha,” he said. This fall, first-time freshman Nebraska residents number 3,497 -- a 5.4 percent climb from last year. UNL’s enrollment of 2,523 minority undergraduate students – 12.6 percent of the undergraduate total – makes this fall’s undergraduate student body the most diverse in school history. The university welcomed 2,485 international students this fall – an increase of 359 students (16.9 percent). There are 1,515 undergraduate and 970 graduate and professional students from other countries. Overall, nonresident enrollments increased by 8.6 percent, including 14.2 percent at the undergraduate level. Nonresident students now account for 29 percent of all students at UNL. In addition to traditionally strong out-of-state markets in South Dakota and western Iowa, the university experienced increases of students from Minnesota (19.1 percent), California (10.8 percent) and Illinois (25.1 percent). Though larger than last year’s, UNL’s new freshman class maintains a strong academic profile. This year’s average freshman ACT score of 25.4 ties the record for the highest average in school history, set in 2012. Graduate enrollment of 4,517 represented a slight dip (0.8 percent) from 2013. The average credit-hour load for undergraduates is 13.8, consistent with last year. The fall semester registrations are reported annually to the provost of the NU system, based on six-day census figures from each of the four NU campuses’ Institutional Research and Planning offices. For more details, see http://www.nebraska.edu. 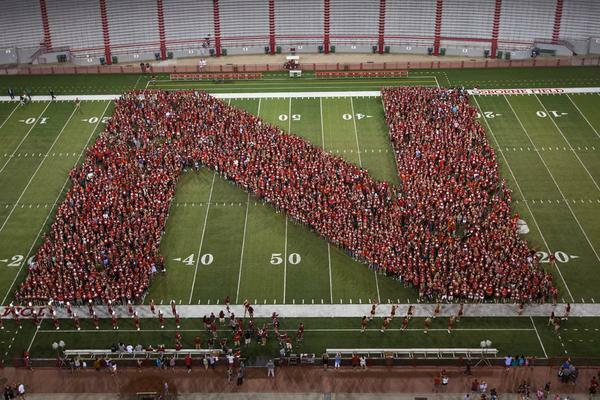 UNL's class of 2018 gathered at Memorial Stadium the week before the start of fall semester.